This Family Studio has a One Bedroom Lockoff attached to it if you want to rent both. The One Bedroom Unit is #290. The Family Studio sleeps 4 and is located in building D and overlooks the Hot Tubs and has an amazing view of the Ski Hill. It is part of the Morning Star Lodge Waterpark complex. With a kitchenette, King Bed, Queen sofa sleeper this unit has everything you need at a very affordable price. Tickets to the Water park can be bought for 22/day or 27/2-day pass at the front desk of the Water Park. I teach and coach at a local HS in Spokane. My wife and I have 9 children. Save a lot of money. Purchase Water Park tickets for 22/day or 27/2-day when you show your room key. In the ski locker room and they are free to use. Silver Mountain is Awesome. Purchase Water Park tickets for 22/day or 27/2-day when you show your room key. The condo was very cozy, clean, and accommodating. Easy check-in and check k-out. My kids and I enjoyed our stay in this studio! The accommodations were beautiful and well kept. The room itself was perfect for a nights get away for our family. Our kids enjoyed the view of the gondola and the hot tubs. The guests next door weren’t very quiet and woke us up pretty early. No fault to owners obviously! We definitely would stay again. Very convenient for a day at the water park! We had a group of 13. We reserved two adjoining rooms, a one bed and studio room with a door to open up to each other and another unit in another building. It was difficult at first to figure out which units were close together. We just went with what we had but I would have loved to know what units were close together and each time I asked I got very one word/short answers. We left our hometown and messaged the owners for a possible early check in. We didn’t hear back so texted about 15 min out and didn’t hear back. When we arrived there was a panel from the dryer off in the unit. We called and the owners had a repair man there within 30 min. . It required a part so we didn’t have a washer and dryer. They were surprised we were there early. One unit had a half roll of toilet paper and no spare. The other studio had no hand soap, but between the two units we made it work. The units were decently clean, a few leftover food crumbs (croutons) on the floor in the kitchen..and an odd smell that went away after a while. We had one hand towel and one wash cloth and no paper towels- next time I would certainly pack more items. We are extremely clean people so my mom and I probably left the place cleaner than it was before, washing every dish before used and wiping down all counters/tables etc. I will say, if you are NOT ok with noise, these may not be the units for you. We were totally fine but the hot tubs are literally right below the rooms and with it being spring break, there were people out past 11:00 pm. Overall the price is half of what you pay through the resort. I would rent again for my family. 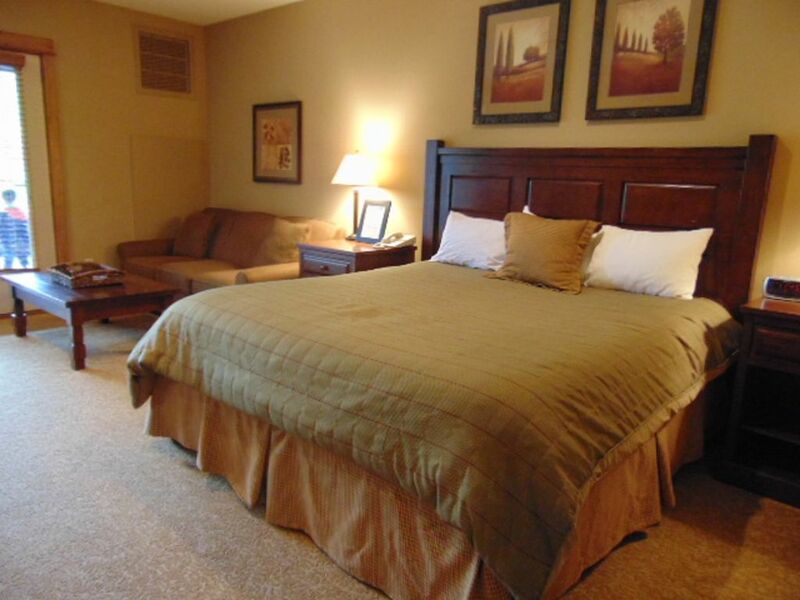 Super clean and comfortable stay! Easy to find. Easy checkin. Great communication with owner. Nice hot tub! Would definitely stay again! Exit 49 off of I-90. Can't miss it.